This structurally sound, low maintenance 3-bedroom, 2-bathroom home had been on Propertyology’s radar for some months. 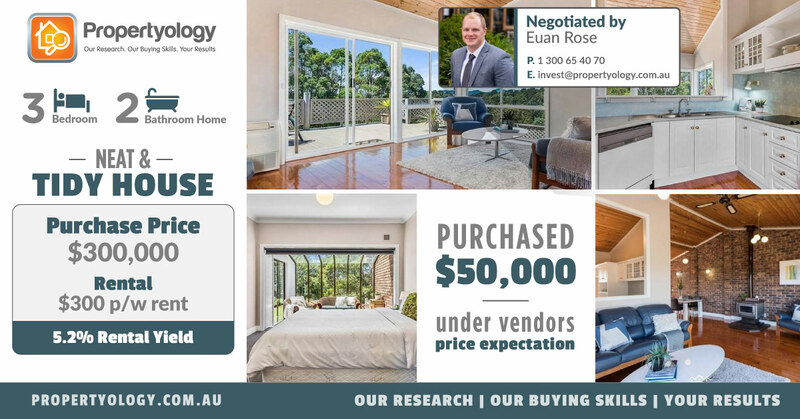 Thanks to our Buyer’s Agent Euan Rose’s ongoing relationship building, this property was actually brought directly to Euan’s attention back late last year. At the time, the vendors were seeking offers over $349,000. Given his in depth knowledge of the market, Euan quickly realised this was quite unrealistic. As such, he moved on. Subsequent to our initial contact, the vendors formally marketed the property for sale (with a different agency) and as Euan expected, they received very little interest at the higher price. A few weeks ago, the sales agent who first brought the property to our attention reached out to Euan again, saying the vendors were now ‘willing to meet the market’. Euan was able to use this to our client’s advantage and was able to secure the property for $50,000 LESS than the vendors had originally wished for last year! Overall we feel this is an exceptional result for our first time client Jenny. Congratulations again, we all look forward to working with you again in the near future! Investing – Strategic, Affordable, and Unemotional.